I was excited to obtain a DragonBoard, an affordable 64-bit ARM single-board computer, but unfortunately it hasn't lived up to my hopes. First of all, it shipped with one terrible problem, making it useless for headless development: The onboard wireless doesn't receive multicast traffic, including ARP requests! And their kernel doesn't provide many modular drivers, so adding any old USB wireless dongle doesn't work until you rebuild the kernel. As of this writing, there is no useful workaround. And that's when I hit the second show-stopper problem. I planned to build kernels for this thing anyway, because the goal is to run LinuxCNC on it with rt-preempt realtime. So I stuck in a large capacity micro-sd card, obtained the kernel source, built it, and rebooted with my new kernel. .. but the new kernel just didn't work. It scrolled kernel messages, but got stuck partway through booting. dmesg implicated the wireless card. This one at least has a workaround: cherry-pick a certain commit from their kernel git. As I understand it, this bug is triggered by using the compiler on the dragonboard, and not encountered with the linaro cross-compiler running on a traditional x86 desktop. Anyway, having found out about this I was briefly celebratory. I booted with my own kernel and had a working USB dongle. Unfortunately, that celebration was short-lived. The USB dongle hasn't been terribly reliable either, particularly under high CPU load. I soldiered on and patched the linaro 4.0 kernel with the 4.0-rt5 patchset. There were a few minor conflicts which I believe I resolved correctly. Unfortunately, the LinuxCNC latency-test readily encounters latencies above 15ms (15000us). 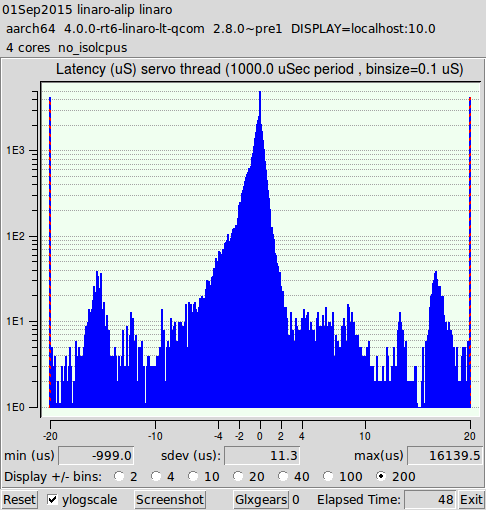 LinuxCNC really would like sub-100us max latencies. I briefly enabled tracers, and have traces that seem to implicate a variety of subsystems: networking, usb, and video *all* figure. More experienced developers than I will have to be the ones to sort out RT on 64-bit ARM. I won a copy of the book Hacker's Delight from John Regehr for my entry in his nibble sort contest earlier this year. In that thread I had heard about the CBMC Bounded Model Checking software, and it gave me the idea to combine the two: a project to take implementations of the algorithms from Hacker's Delight and prove the algorithms' properties with CBMC. Anders Wallin recently discussed generating graphs of server time error using a timestamp from the Date: header of an http request. NTP servers themselves have estimates of time error, and it's possible to get the local server's idea of the error by sending SNTP packets to the local machine. You can also see the last time this NTP server successfully communicated with a peer or upstream, and see whether the server considers itself desynchronized by checking the stratum and leap second fields. Here's how to run the debugger on realtime code in the "unified-build-candidate3" branch from linuxcnc.org. This assumes you are using a run-in-place tree with a userspace realtime model, and that you understand the basics of gdb. 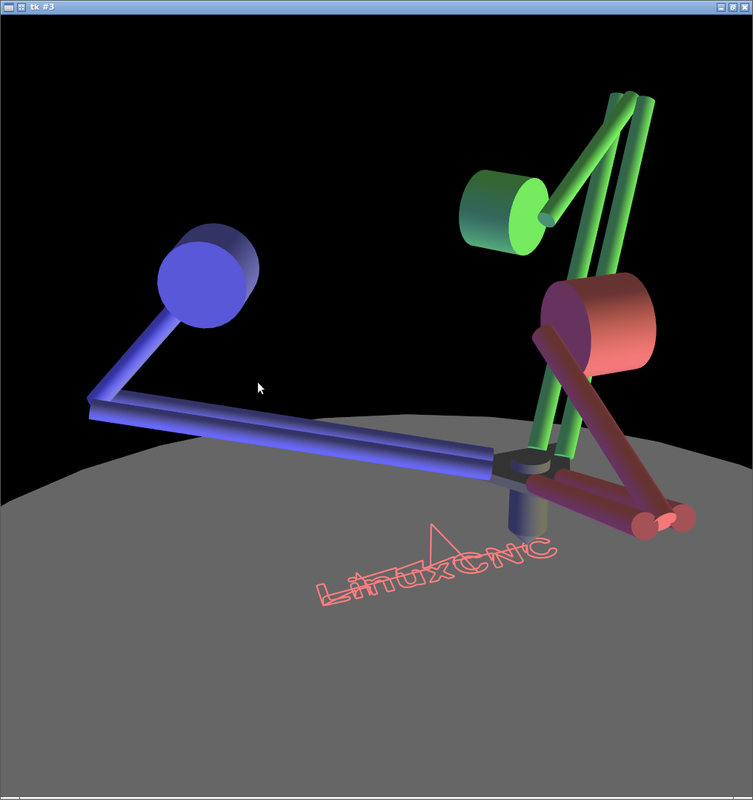 Together with Chris Radek, I've been working on a visualization for his Rotary Delta Kinematics. Here's a picture of the work, which he hopes to push to git.linuxcnc.org soon. Of course the plot is of the AXIS splash screen.